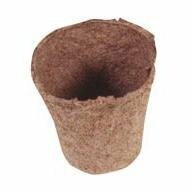 Jiffy Peat Pots 3in Round X 3in Deep (Pack of 1404) by A.M. Leonard at Tulips Orchids. Hurry! Limited time offer. Offer valid only while supplies last. Made from a mixture of sphagnum peat and wood fiber, 3in. round x 3in. depth. Made from a mixture of sphagnum peat and wood fiber, 3in. round x 3in. depth. 1404/Case.